Watching TV is the is the most entertaining activity while being is a living room or media room! A TV should always be set on a convenient height level, mostly in front of a living sofa so that one could watch it without twisting his neck which is sometime painful! If you are not in a financial condition to afford a market version of media stand then here is the opportunity for you to build your own at home! 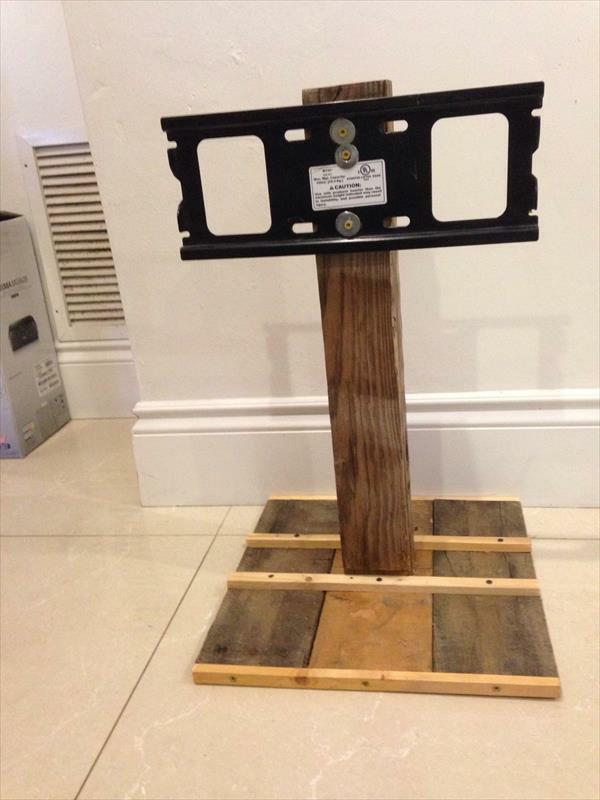 Checkout here this simple but functional DIY pallet TV stand, capable to hold your light weight TV and monitor easily! Stand comes on a flat squared base and a thin vertical stand having hardware hanging system at the top! It is really a much cost-effective solution for a media stand which is really fun making element of furniture found in all media rooms! Make it painted or stain it to ensure its life time stability and also to match the interior media room decors!